Foundations, Part H, of any structure, large or small, must be built to safely transmit all loads of the building to the ground. If foundations are not correctly built, walls may crack and at worst, could even collapse. While the National Building Regulations specify general requirements for foundations, it is the deemed-to-satisfy rules contained in SANS 10400 that give you more detailed information about how to ensure that your foundations comply. Furthermore, the building regulations require you to have a competent person involved in the build of your home. You must also have plans drawn up according to the regulations AND the requirements of your local authority. This will ensure that the necessary controls are in place, and should guarantee that your structure will be safe and legal. SANS 2001-CM2 covers construction works for a variety of foundation types (strip footings, pad footings and slab-on-the-ground foundations) for masonry walling. SANS 10161 covers the design of foundations for buildings in general. SANS 10746-2 relates to information technology, specifically open distributed processing. The reference model for this standard is foundations. SANS 12575-2 which covers thermal insulation products, specifically exterior insulating systems for foundations. This is highly technical and really only for the professional use of commercial/industrial installers of foundations. All these standards are available for a nominal fee from an SABS office or from the SABS online store. The SABS also holds certain international standards, many of which were formulated by the International Standards Organisation (ISO). ISO standards relating to foundations refer to thermal insulation (ISO 12575-2:2007), thermal performance of building in cold weather, when there is frost (ISO 13793:2001), and information technology (ISO/IEC 10746-2:2009). There is another IEC (International Electrotechnical Commission) standard available: IEC 61773: Overhead lines – Testing of foundations for structures. The National Building Regulations and Building Standards Act, 1977 was amended substantially in 2008. In terms of Part H of the regulations the amendments amounted to an expansion rather than an alteration as such. Part H and Part B (which covers structural design) of the building regulations go hand in hand. So basically, if your foundation is designed and the concrete placed in accordance with the requirements of Part B, you’ll be safe. Part B “establishes the representative actions and impacts applied to building elements and structural elements, and their structural response to these representative actions and impacts”. It “also establishes requirements for rational designs and rational assessments, Agrement certification and buildings on dolomite land”. This Part of SANS 10400 was only approved on August 31, 2012, four years after the legislation changed. It is available from the SABS for R369.36 incl. VAT. 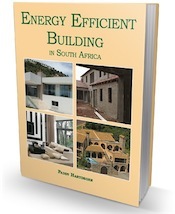 Part H, (available from the SABS for R427.50) approved at the same time as Part B, “establishes the representative actions and impacts applied to foundations, and the response of structural elements to ground movements. Buildings that comply with the requirements of this part of SANS 10400 will also comply with the structural design performance parameters established in SANS 10400-B. It contains simple design and construction requirements for foundations for certain masonry buildings to accommodate a relatively small range of ground movements”. In addition, there are a variety of other SANS available that relate to structural design, although most are intended for industrial and larger commercial structures, with a couple relating to the structural use of timber (SANS 10162-1 and 10163-2). The basic rules for foundations relate only to walls that are placed centrally on foundations – which ensures that they will safely transmit loads; AND are built on good quality ground soil – NOT heaving soil or shrinkable clay. So if there are ground issues on your site, or special foundations have to be designed by an engineer for some other reason, you cannot rely on the dimensions specified below. 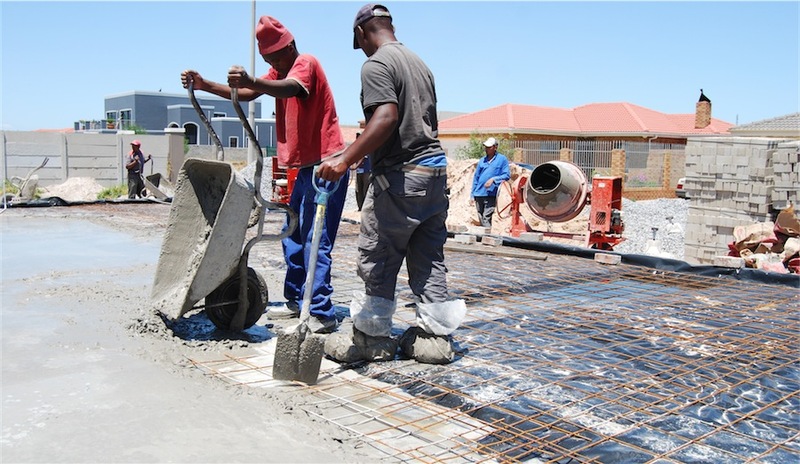 Basic, uncomplicated foundations should be constructed with concrete that has a compressive strength of at least 10 MPa at 28 days, OR concrete that is mixed proportionately by volume in the ratio 1:4:5 cement:sand:stone. Mixing by volume involves carefully measuring out of the materials in a same sized container. A wheelbarrow may be used, but it is not a suitable method for large building projects. Continuous strip foundations should be at least 200 mm thick, unless laid on solid rock. The width of continuous strip foundations should be at least 600 mm if the foundation is for a load-bearing or free standing masonry wall, or a timber-framed wall that supports a tiled or thatched roof (which should, of course be constructed according to the building regulations), OR 400 mm if the wall is a non-load bearing internal wall or a timber framed wall that supports a metal sheet, fibre-cement sheet or light metal-tiled roof. If a strip foundation is laid at more than one level, it is important for the higher portion of the foundation to extend over the lower portion for a distance that is equal at least to the thickness of the foundation. If there is a void between the top section and lower section, you will need to fill the void with concrete that is the same strength as the concrete used for the foundations. Sometimes people thicken an existing concrete slab to form a foundation. In this instance, the TOTAL thickness (ie the concrete INCLUDING the original slab) must be at least the thickness that is usually required for continuous strip foundation (200 mm). The width of the thickened portion under the floor slab must be at least the thickness of a continuous strip foundation (see above). The only time you won’t have to add additional thickening is when the walls are timber-framed and NOT load-bearing. If a pier is built into the wall, or forms a part of the wall, the thickness of the foundation to the pier must be the same as the foundation required for the wall itself. The length and width of the foundation to a pier should project by 200 mm at any point on the perimeter of the pier (see drawing). The thickness of the foundation to a supporting sleeper pier or sleeper wall must be at least 150 mm; the length of width of the foundation to the sleeper pier must be at least 450 mm; and the width of the foundation to the sleeper wall must be at least 300 mm. If you are building a simple structure (a granny flat, a garage or perhaps a freestanding workshop) on flat ground or on a site that is easily levelled, you can rely on these dimensions and specifications. But don’t forget that the building regulations require you to draw up plans which a “competent person” must submit to your local authority for approval BEFORE you start construction of the foundations. Good afternoon. I have a 1970s single skin double garage with 600×150 foundations and wish to go double story with a granny flat above. I know i will need to add a a further skin to my walls to take the load and tie that in with brick force and butterflies but am uncertain what to do with my foundations and how to strengthen them up to take the load. The other thought is to make it self supporting and do a steel structure with columns on a suitable plinth but not sure that wont cost more. Hi Warren, With additions like this you will need to submit plans done by a competent person and they need to do an inspection and advise you if your foundations will take the extra weight before drawing the plans. It is not only the size of the foundations but the type and quality of the soil under the foundations that is equally important.